It’s officially the year of the pig, but when it comes to Chinese stocks, it’s looking more like the year of the bull. Chinese stocks have outperformed their U.S. counterparts recently. The FXI, which tracks the biggest China-based companies, has gained more than 4 percent in the last six months, while the S&P 500 has shed nearly 3 percent. This comes amid an ongoing trade battle between the United States and China over tariffs, with the Chinese delegation currently in Washington for trade negotiations ahead of the March 2 deadline when increased tariffs could go into effect. Despite the political uncertainty, two market experts argue that the run in Chinese stocks is just getting started. The last time the FXI traded there was in June. Newton points out that a bullish base has been forming since the beginning of January, which indicates that a breakout could be near. He attributes much of the recent strength to a pullback in the dollar, which is typically good for emerging markets. 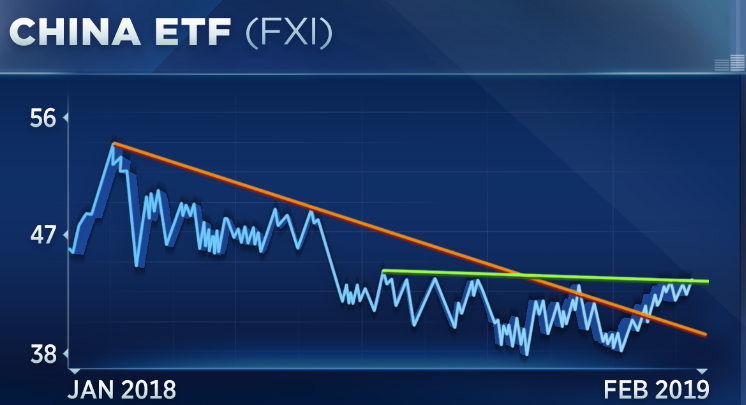 Newton isn’t the only one taking note of the FXI’s move higher. According to Susquehanna’s Stacey Gilbert, options traders are betting that this trade hasn’t yet run its course. “When we look at both the ETFs and the options investors certainly are agreeing … that where could be more upside here,” Gilbert said. She notes that traders are specifically buying FXI calls at the $44 strike level, which means they are betting the ETF breaks above that level in the near term. While highlighting the options volume in the FXI, Gilbert was quick to note that this isn’t an ETF-specific bet. Rather, investors are buying many different ETFs that aim to capture any upside out of China. “Overall, I would say yes both on the cash level as well as the options level, investors are positioning bullish for China,” she said.